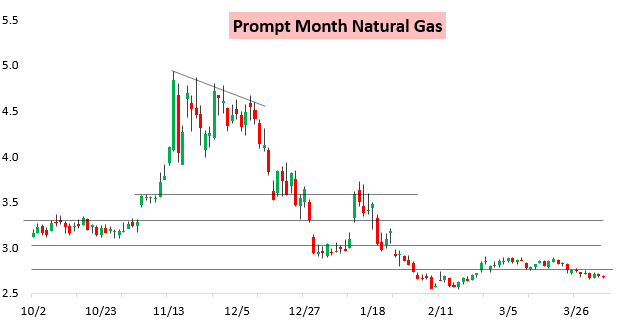 Today proved to be a very slow day in the world of natural gas, with the May contract finishing down just seven ticks on the day, with a daily trading range under 4 cents. 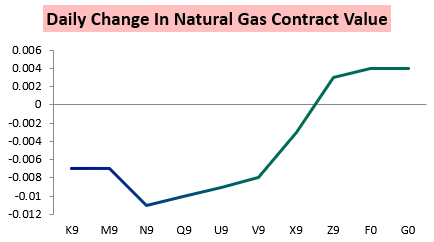 The downward pressure we saw was in the front part of the natural gas curve, with the later dated winter contracts actually finishing up a few ticks on the day, but none of the contracts moved significantly. 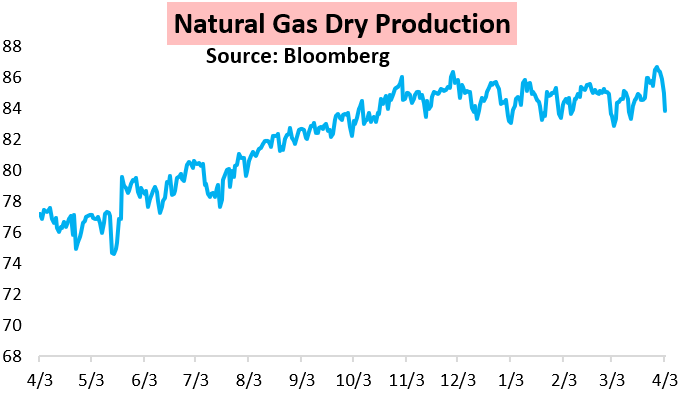 The weight on the front of the curve has largely been a result of robust supply, as natural gas production hit record high levels this past weekend. While this week's data shows a decline, the overall trend is back up over the last few weeks after some freeze-offs limited supply levels in early March. On the weather side, we saw little net day over day change, partially explaining the stagnant nature of prices today. 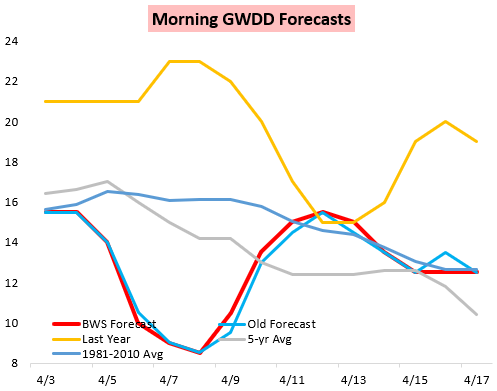 Our morning GWDD forecast was very close to yesterday afternoon's forecast, with some modest mid month chill, nothing like the levels of cold seen one year ago, but enough to keep demand at levels preventing further downward price moves. Even the afternoon models today offered little reason to expect notable changes, showing highest risks for cold from the middle of the nation into the interior West, with just passing shots of cooler air through the Northeast. Will the demand ultimately be enough to support prices, or will abundant supply levels break our range to the downside? Sign up for a 10-day free trial here to give our research a closer look! 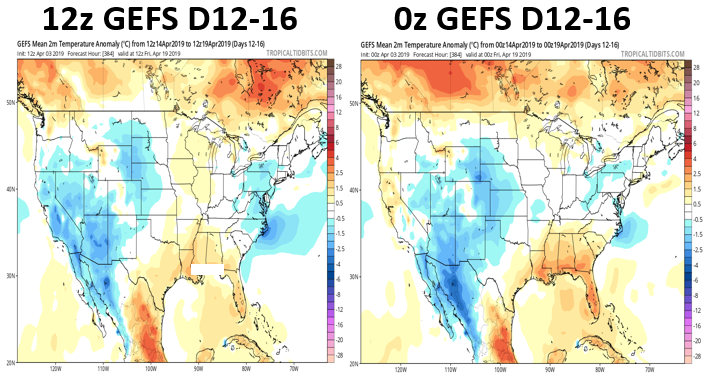 The above blog was prepared by Brian Lovern, an experienced meteorologist with more than a dozen years of work in the energy space, including supporting large trade floors, as well as multiple years of personal natural gas trading experience. Founder Jacob Meisel has recently begun full-time employment at an energy trading and research firm and will no longer be handling the day-to-day operations and content creation of Bespoke Weather.